You’ve probably used aloe after having spent too much time in the sun. You’ve seen it listed as an ingredient in many of your personal care products. It’s always been there. Simple. Ordinary. Trusted. The reason aloe vera gel is trusted in everyday products is that its use dates back thousands of years. Ancient civilizations revered this extraordinary botanical substance for its astonishing properties. Its legendary uses have been passed down through time, enhanced by scientific innovation and centuries of experience. But aloe has more uses than just applying it externally. If you know what aloe vera does for the skin, can you imagine what it does for your inners?! In order to ensure the highest quality, Forever cultivates aloe vera on its privately-owned plantations, avoiding the use of herbicides or pesticides. With over 50 million aloe vera plants, Forever’s aloe vera plantations work to cleanse the earth of two million tons of CO2 every year. Valued since ancient times, the highly concentrated aloe vera gel is delicately separated from the leaf pulp and gently stabilised in a special patented process. The key to Forever’s success is a commitment to quality and purity. From planting and tending, to harvesting, Forever’s aloe plants are carefully nurtured with the same level of care and standards that it puts into every one of its products. Forever farmers harvest the aloe by hand, treating it with great care. The leaves are processed within hours, to provide the purest, freshest aloe vera gel with all of its inherent qualities intact. Forever’s aloe vera is one of the purest available on the market. Treated with the greatest care, avoiding pasteurisation, freeze-drying and heating, the aloe vera retains its beneficial properties. This is ensured by the thorough and regular checks carried out by Forever, commencing at the cultivation stage, through production and all the way to distribution. The purity of the gel is the foundation of all Forever products. In our shop you will find a complete line of nurturing products based on 100% pure aloe vera gel. Harvested by hand from our own plantations and immediately stabilized for purity, our aloe nourishes your body—inside and out—with products ranging from age-defying facial treatments to healthy antioxidant rich drinks. There is so much more to aloe vera than you probably know. 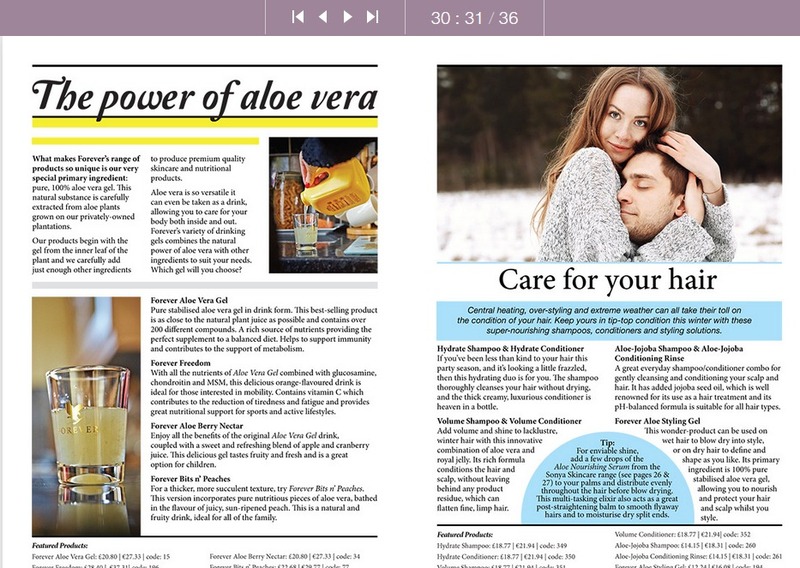 You can read more about it in the emagazine Aloe Matters. Please note that the effects of the products discussed are not intended to diagnose, mitigate, treat, cure or prevent a specific disease or class of disease. You should consult your physician if you are experiencing a medical problem or if you are on medication, because food supplements can interreact with conventional medication. Or consult a pharmacist.